Members of the organization discuss candidates, issues and a variety of other things that affect Democrats, both inside and outside of school. Laura Mannara receives a lot of angry phone calls. “One of the weirdest calls I’ve ever had was when some guy called and said ‘Democrats are ruining America’ and then he just hung up the phone,” Mannara said. 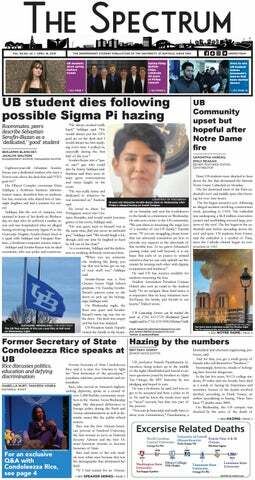 When she’s not interning at Sen. Kirsten Gillibrand’s office, Mannara, a senior economics and political science major and president of UB College Democrats, spends her time debating politics with other students at UB. UB College Democrats meets every Wednesday at 6:30 p.m. in Student Union 306. Students who are looking for more information about presidential candidates and issues with the looming election are always welcome, so they can become more informed for when it’s time to step into the voting booth. “Our purpose is to educate the student body on local political issues and what’s going on in the political world as whole,” Mannara said. According to Mannara, most meetings consist of about 15 or so students discussing a political topic that seems appropriate at the time. One of the topics recently discussed in one of their meetings was the water crisis in Flint, Michigan. Mannara is passionate about politics – and she isn’t the only club member that thinks so, especially for college students. “[Politics is] a good thing to talk about and I don’t like that some people are apathetic about it,” said Matt Bartlett, a sophomore mechanical engineering major. Some students might be intimidated by the idea of showing up to a club and debating with others. But according to Andrew Moran, a senior physics major, the discussions are not as intense as some might expect. With political debates, primaries and presidential races happening, politics is no doubt a popular topic of discussion. But with busy college schedules and not enough time, some students might lose interest in the political realm. Moran doesn’t think this should be the case. Within this politically-charged club are members who feel passionate about the issues and candidates. Fortunately the club finds the opportunity to bring in guests from both inside and outside UB to help fuel discussion. Jim Kennedy, the Western New York Regional Director for Gillibrand's office, attended the club meeting on Wednesday, Feb. 17 as a guest speaker and shared his political experiences as well as some of his opinions with students. Kennedy agrees with Moran on the importance of college students getting involved with politics. Kennedy talked about student loans being an important topic of discussion. Some politicians favor having higher interest rates on them while others want to lower them. Kennedy believes it is important college students find a candidate that supports their views. “It’s about knowing what issues are important to you and actually going out and voting for the people who are inline with how you feel,” Kennedy said. Although the name of the club may imply it’s solely for those with democratic views, students of any political affiliation are welcome to attend UB College Democrats events – even those who are on the opposite side of the spectrum. Members of UB College Republicans, one of the other political groups on campus, attend some UB College Democrats meetings. While some students wouldn’t enjoy it if an opposing club were to show up and disagree with them, Mannara believes that getting both sides of the argument in the same room is what UB College Democrats is all about. For those looking for a way to get more involved with the political discussion on campus, UB College Democrats acts as a place for students to come together – even if it is to disagree.